​Approaching the front registration desk, stop and feel the ambiance of the Hotel Pattee lobby. The mahogany wood, reproduction chandeliers, massive stone fireplace, and Persian rugs set the stage for this unique example of Arts and Craft design. To your right you see the registration desk, with its mica shaded lamps, and note an unusual bronze sculpture at home on the granite counter top. This sculpture is none other than Perry native Snick Hamlin’s cartoon character Alley Oop, interpreted in bronze by artist Gary Ernest Smith. 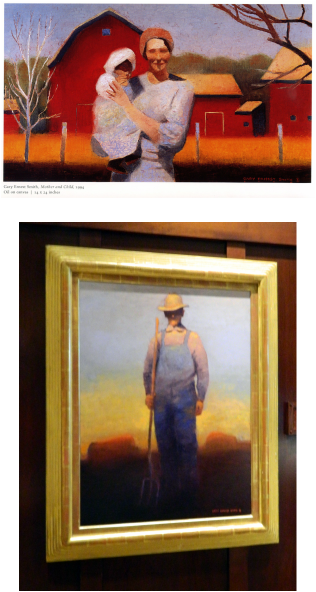 Smith’s art is seen throughout the Hotel Pattee in various public spaces, as well as in executive offices. Behind the registration desk, your eyes are drawn to Gary Ernest Smith’s Mother and Child; note the vagueness of both mother and child’s facial features, very representative of Smith’s work. The barn and out-buildings take us back to another era, when life revolved around the farm. To the left of the doorway we see another oil by Gary Ernest Smith, in this piece, Sunsets in the Fields, once again the principal has unspecific facial features. The farmer’s hard working face is obscured in shadows cast by his hat.